David BRYCE was born in Scotland in 1805, no particulars of his parents are known at this stage. He married Elisabeth DAWSON the daughter of George DAWSON, a farmer of Ayr, at Alva on 17-8-1833. David and his two brothers John and James came to South Australia with their respective spouses and children. The BRYCEs came out on the new "Wakefield" plan of free settlement they were on the ship "Fairfield" and arrived on the 14th December 1840 in Sth. Australia. As yet this history only covers descendants of David BRYCE. John BRYCE, born Alva Scotland 8-1-1836. Married Sarah Ann FITHALL at Mount Beckworth on 26-4-1860. Had ten children. Farmer Dunbulbalane, Vic. Died aged 75 at Dunbulbalane, on 12-10-1911. Buried at Katamatite. Isabella BRYCE, born at Alva, Scotland 13-6-1838. Married Heindrick KOHN, probably at Mt. Beckworth. Had 10 children. Settled at Merino,Vic. Died aged 77 on 2-11-1915. Buried at Merino. 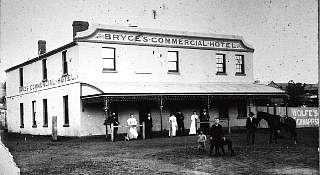 David BRYCE, born Adelaide 1842. Married Margaret CLARK at Mt.Beckworth. Had 11 [sic 13] children. Farmer at Birchip. Died aged 78 on 5-5-1921. Buried at Birchip. Ann BRYCE, born Adelaide 1845. Married William FITHALL on 11-2-1864 at Talbot,Vic. Had 3 children. Settled at Moolerr, near St. Arnaud. Died aged 93 on 4-3-1938. Buried at St. Arnaud. James BRYCE, born Adelaide 1847. Married Jane JENKINS at Mt.Beckworth on 6-4-1871. Had 12 children. Farmer at Traynor's Lagoon and Moolerr, near St. Arnaud. Died aged 91 in April 1938. Buried at St. Arnaud. Charles Dawson BRYCE, born at Dry Creek, South Australia on 26-6-1849. Married Jane RHODES in 1883. Had 4 children. Settled at Merino, Vic. Carpenter and hotel-keeper. Died aged 74 on 2-5-1924. Buried at Merino. When David BRYCE was forty six years old he was killed on the 21st. May 1851, he was travelling with a bullock team from the Burra copper mine, a hundred miles north of Adelaide, when at Little Para near Salisbury, he fell beneath the wheels of the copper laden wagon and was crushed to death. His place of burial is probably at the near by Salisbury cemetery. After her husband David's death, Elisabeth, now with 6 children to support, married Joseph BOWMAN, a bachelor farmer of Turtle Scrub near Burra, at the Kooringa Church, Burra on 16-9-1852. At about this time the rich gold discoveries in Victoria were attracting great numbers of people. BOWMAN / BRYCEs with bullock dray took 6 long weeks travelling from Sth. Australia to Victoria where they engaged in gold digging at Avoca and Daisy Hill, Talbot for a period of 3 years. Then in the roaring fifties 1856 they quit the goldfields and purchased land at Mt.Beckworth, near Clunes Vic. They built "The Stirling Castle Hotel", the remain are still there to this day. David BRYCE's widow, Eilzabeth BOWMAN (nee DAWSON) died at Merino in 1890, aged 82 and is buried in the Merino Cemetery. Charles Dawson BRYCE born 28-6-1849 in Dry Creek, Sth. Australia. Married 2-5-1883 in Sandford, Vic. Died 2-5-1924 in Merino, Vic. Spouse Jane RHODES born 15-1-1856?7 Portland, Vic. Died 18-5-1937. Both at Merino Cemetery. Son William Rhodes BRYCE born 6-5-1886. Married 22-10-1908 in Merino. Died 8-10-1954 in Hobart, Tasmania. Spouse Edith Helena HEAZLEWOOD born 1887 in Digby, Vic. Died 5-2-1937 in Merino, Vic. Son Dudley Charles BRYCE born 27-9-1909 in Merino. Married 19-11-1938 All Saints Church East St.Kilda, Vic. Died 24-2-1954 in Hobart,Tasmania. Spouse Beth COFFEY born 6-3-1916, Toorak, Adelaide, SA. Died 14-7-1974 in Prahran, Vic. Bryce James ROUSE born 14-6-1975 at Bunyip, Vic. Lloyd Cameron ROUSE born 16-2-1977 at Bunyip, Vic. Jenelle Ann ROUSE born 26-10-1978 at Bunyip, Vic. Jill Rouse (Nee Bryce), Cora-Lynn, Victoria.